Tip $25 and get One Bri Bagwell AND one Tim Nichols CD mailed to you! kate-kinder: If we were on periscope I'd give you lots of hearts! Linda Piazza bought reward: "One Bri Bagwell AND one Tim Nichols CD mailed to you!" melakneerows: I like it on guitar, haven't heard it this way before. Tom & Gail Hanna: Thanks for requesting When I Kissed You Bri! TRDonJuan bought reward: "Tim Nichols and Bri Bagwell CD emailed to you!" vanita-hatch: check is in the mail!! bought reward: "One Bri Bagwell AND one Tim Nichols CD mailed to you!" melakneerows: There's a version of this on youtube of Bri and Bo Brumble and it's my favorite live video on the web. Tom & Gail Hanna: thank you! TRDonJuan: Get Brian a Rebecca Creek shirt Bri! Thank you for the show. Bri, you are a wonderful artist. What was your favorite part of the performance? Just love listening to Bri! I'm be of my favorite Musicians! First time to hear Tim, great Guy! Great song Bri, and that's my favorite Nichols song!! Tim Nichols and Bri Bagwell CD emailed to you! One Bri Bagwell AND one Tim Nichols CD mailed to you! Bri Bagwell is real country music, and what country music should strive to be. She is an independent artist without a record deal, and without management. Her popularity is derived 100% by word of mouth and her raw talent. This grass roots effort is rare these days; it speaks to her infectious music and appeal. She fell in love with music at an early age, and started playing in a band with her older brothers while just a teenager growing up in New Mexico. A couple of weeks after turning 18, she moved to Austin, TX to study at UT and begin her music career in the live music capital of the world. Late nights, rowdy Texas crowds, and being alone on stage with just a guitar shaped her onstage charismatic charm. She learned to gain a crowd’s attention with her beautiful voice, singing songs she wrote herself. Her first CD, “Banned from Santa Fe”, released June 2011, sold through several printings, and gained traction very quickly among music fans. 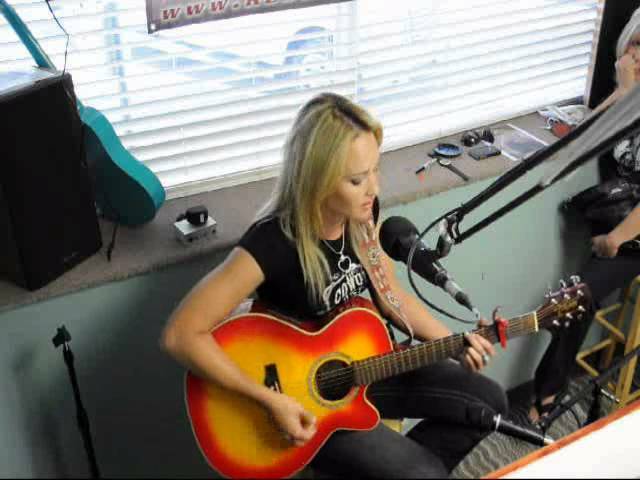 Bri Bagwell was the only female artist on the Texas Music Chart for a few weeks with her single, also titled “Banned from Santa Fe" and her song "Whiskey" became her 1st top 15 hit and has passed 70,000 YouTube views on the single's video. In 2013, Bri released her self-titled EP, which featured two brand new radio singles, “Hound Dog” and “Crazy”. Her latest radio release, “Crazy,” has been praised for its witty and relatable lyrics, and it continues to climb the Texas charts. When she’s not on tour, you can find Bri in Nashville, Tennessee, writing songs for Sony/ATV Publishing on Music Row. In the internet age with music coming at you from every type of media, it is harder and harder for artists to get attention. Bri Bagwell is not only gaining attention, but she is also drumming up excitement; and, she does it all without a million-dollar budget.